So the motor comes last, which is funny because it is what we all dream of modifying first, and of course, the results are noticable from the moment we start the car, something the other modifications do not allow us to savor. So again it all comes to what do you want. Aside from the cheap bolt-on mods that anyone can do (electronic ignition, electric fan), anything else does require that the motor to be freshened up, which means it has to come out of the car. The only way to increase hp is to increase the compression. NOT changing the carbs, NOT adding headers. Power comes from the head, so machining the head for increased compression and skimming the block for zero-deck clearance for 10.0:1 compression is the biggest move you can make. Any higher compression means that you may not be able to use pump gas, but if you know how to tune cars and adjust timing for best results, 10.5:1 should be safe. MSD make a nice spark retarder which can be put to good use. After that, giving the valves a 3-angle valve job, and porting/ polishing the ports is important. A wilder cams allows you to take advantage of all of this, and roller-rockers (1.55:1 ratio, the 1.65:1 ratio is for dedicated track motors only) will only make a good cam better. Have the cam-bearings line-bored to accept Spitfire bearings to work around the TR6's design fault of having the cam ride directly on the head. Of course, if you are going for serious power, don't forget to strengthen the bottom end (magnaflux, nitride, weld and machine), and peen-shoot the con-rods for 30 minutes each, or even replace them with Carrilo rods. Have the whole bottom end knife-edge balanced, and invest in a good harmonic dampener. I believe that there are stronger forged cranks available in the UK, which enable the 6 to run to 7,000 rpm (not advised with the standard cast iron crank because it flexes too much). Moldex may make a billet crank which would be even better, but they quoted me $7K for being the first. Forged cranks are available in the UK, but they are not as studly as billet. IMHO, titanium pushrods are a little overboard, but they do feel nice to the touch! Topping off the Carillo rods with JE pistons will save a total of around 270g rotating mass per pot over lightened stock components, or a massive 375g/pot over stock components. These weights include bolts, wrist pins, rings, etc. Overall, that is 2.25kg or nearly 5lbs off the rotating mass. Doesn't sound like much? At 7,000 rpm, this is a seriously positive modification. For clutch and flywheel information, see my notes on drivetrain modifications. throttle routing and vacume maintenance. As you can see, it can get mighty expensive mighty quickly. A basic engine rebuild will cost around $2K. A really nice streetable motor will cost around $5K, and from there it can reach $15K in a big hurry (ask me how I know!). Still, it is cheaper than a Jag straight-6. 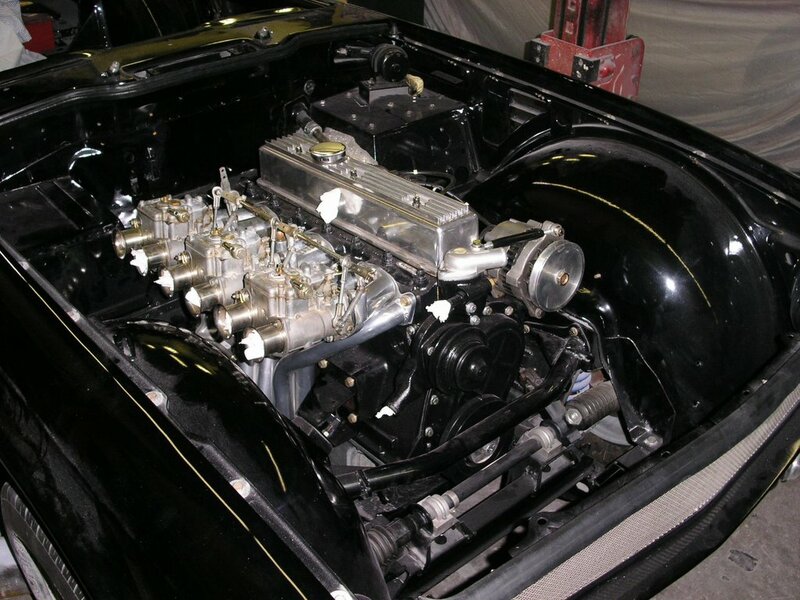 Note on engine swaps: A lot of people drop small-block V8s into their TR6. This is certainly cost-effective compared with building a manly straight-6. A Ford GT40 crate motor costs $3K, and produces over 300 horses out of the box. Not only that, with an aluminum intake manifold, it weighs less than the Triumph motor. Certainly this is the way to build a fast TR6, but it won't sound like one, rather it would sound like any other pony car out there - boring, IMHO. The straight-6 motor is quite rare these days, BMW and Toyota being the remaining builders. V8s are a dime-a dozen. Who wants that? Note on Mazda E-series pistons: There appears to be a lot of interest in this conversion, which requires that the block be bored 0.11" over, and using Mazda E-series flat-top pistons. In theory, it is almost a bolt-on deal, requiring only some machine work to the wrist-pins. The Mazda pistons are well made, can survive high-compression, and are a lot cheaper than cast AE Hepolite pistons. Furthermore, the capacity increase to 2.7 liters cannot be ignored. I had the block extensively sonic tested, and even though the overboring would not have punched through to the water jacket, the wall thickness was around 0.050" thinner than Triumph recommends for a stock motor. With my motor producing considerably more horsepower and with much higher gear-shift points, I looked into re-sleeving the cylinder walls. Ultimately, this conversion would cost over $1,000, so I have decided not to go this route. It is possible to do this without resleeving the cylinders, but it would only be a short time before this motor would destroy its-self. My goal is to build a robust motor, not a grenade.